Maybe the most exciting news about the Nats broadcasting teams this Spring Training is the new weekly Charlie & Dave radio show titled, “Nats Spring Training Live!” which will broadcast live on Monday evenings during the Grapefruit League schedule. In addition to their regular game programming, 106.7 The Fan radio will be broadcasting this 90-minute Nationals talk show once a week during Spring Training beginning Monday, February 25th, and each show will be hosted by Nationals radio voices Charlie Slowes and Dave Jageler in a live format in front of an audience. The show will be broadcast live on Monday evenings from 6:30-8:00 p.m. ET from the Brother Jimmy’s BBQ location at CityPlace in West Palm Beach, FL. This is the same Brother Jimmy’s BBQ which is at the National Harbor near the MGM and the Potomac River and that location will host the final Spring Training show on Wednesday, March 27th which is the day before Opening Day. This event will give Nationals fans one final opportunity before Opening Day to see Charlie and Dave preview the Nationals 2019 season right here in the D.C. area. The show will be great, and it expands 106.7’s coverage of baseball that fans have been clamoring for. If all goes well, this show could be a regular addition to the Spring Training coverage. For now, this is a one-year tryout. 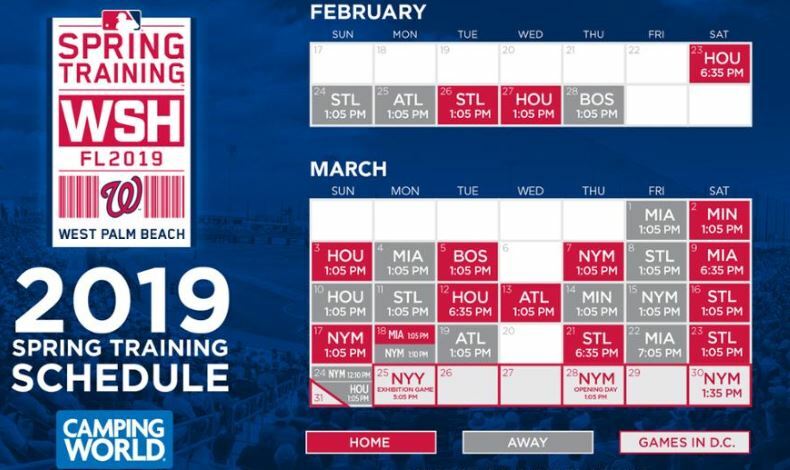 Below you can find a schedule we compiled that includes all of the Nationals Spring Training Schedule with details about where to find the TV and radio broadcasts for all home/road and split-squad games (subject to change). This season in the Grapefruit League there are only six games televised on MASN and seven games on the 106.7 The Fan radio network. All games have either home or road coverage on radio or the TV except for 7-games. If you have anything to add or see something that needs a correction, please email us.